The inaugural issue of Argument & Computation just dropped in the pigeonhole, which is a delight to see… and there’s open access to the first issue. Congratulations to the editors — a great milestone to see as the field matures. 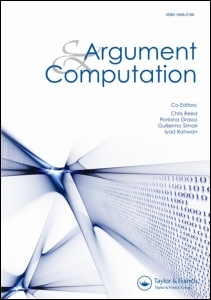 In order to distinguish itself from the competition, the new journal will not solicit papers that are wholly within the theory of argumentation without application (practical or theoretical) with in artificial intelligence or computer science, nor will it solicit computational work that fails to employ argumentation as a core focus.